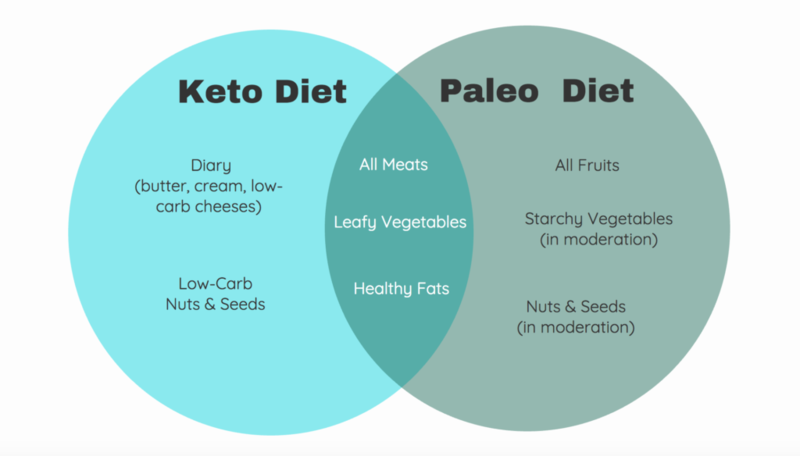 Ketogenic Diet vs. Paleo Diet: How They Differ: They are two of the most popular diets today—and not just for their weight loss benefits. Both the ketogenic and Paleo diet help with reducing inflammation, the culprit for chronic diseases. They have been shown to boost immunity and to aid recovery from autoimmune disorders, and they have been linked to improved mental clarity and higher energy levels. 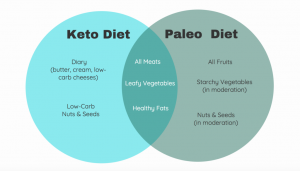 And yes, there is some overlap in their principles, but the ketogenic and Paleo diets are still distinct in a number of ways. Learning and understanding those differences could be the key to finding the right diet for you. For starters, the ketogenic diet aims to push the body into ketosis, a state in which your body burns fat. To get to that point, you’ll need to stick with a program that’s generally low in carbohydrates, moderate in protein and high in fat. It’s also worth noting that this diet was originally developed for disease management and to this day is being used for conditions such as epilepsy. The Paleo diet’s premise: eating the way our ancestors did thousands of years ago—when chronic diseases weren’t as prevalent as they are today— is the key to better health. Thus the diet is focused on making food choices that reflect the fact that people back then hunted and gathered what they ate and had little access to grains and no access to processed foods and refined sugar. So your primary options are protein-rich animal products, nuts, seeds, berries and wild plants. The ketogenic diet is definitely low-carb (as it needs to be in order to burn fat for energy, create ketones and keep insulin levels low). The Paleo diet isn’t necessarily so (carb levels vary from low to medium) but usually way less than the standard American diet. The ketogenic diet does not allow high-carb tubers and root vegetables like sweet potatoes and carrots. In contrast, these are fully embraced in the Paleo diet because they are packed with nutrients and are free of toxins or gut irritants. Also, fruits on a Ketogenic diet are limited to berries. In Paleolithic times fruits would have been more seasonal so that would also limit availability and amount consumed. Protein intake is moderate in the ketogenic diet and high in the Paleo diet. But when it comes to protein sources, they are relatively the same: meat, fish, eggs, nuts and vegetables. Grass-fed, organic and free-range are preferred for higher nutrient value and sustainability factors. The Paleo diet, however, is stricter when it comes to plant-based protein. Lentils, peanuts, beans and other legumes are specifically discouraged. Legumes are more of an agricultural era product and earlier generations spent time soaking and spouting beans to make them more digestible, a step often skipped today. The two diets differ in the source, type and amount of fats they require. The ketogenic diet is high-fat and allows fats in the form of cooking oils (e.g., vegetable oils) and dairy products (e.g., ghee, butter and full-fat sources like cream cheese, hard cheeses and heavy cream). The only caveat: They should not be hydrogenated such as margarine and more information is coming to light that vegetable oils such as corn, soybean and canola oils increase inflammation and should also be avoided for optimal results. The Paleo diet is more limited in terms of cooking oil options; they must be derived from plants, i.e., avocado, coconuts or olives. Butter is used by many followers as long as it’s produced from grass-fed animals. Dairy products are a no-no, especially for hard-core Paleo practitioners. To meet your intake requirement for fats, you can fill up on seafood, seeds and nuts. It is a good idea to take out dairy for 30 days or so then add it back slowly to see how your body reacts. Some people choose to include some sources of grass fed dairy and raw dairy into their Paleo plan which would be an approach coined as: primal. All types of grains are prohibited in the Paleo diet and on the ketogenic diet. There are some pseudo grains such as buckwheat and quinoa that many followers enjoy on occasion. It is best to try these only after several months of following a Paleo diet for best results so that the gut has a chance to heal. On some versions of a low carb diet there is a reintroduction of grains during maintenance but most people choose to avoid them long term to keep weight off. Like other low-carb diets, the ketogenic diet discourages fruit, as this form of sugar contains fructose and glucose, both said to contribute to insulin resistance and weight gain. The exception would be a handful of berries occasionally because they have a good balance of sugars and high antioxidant value. The Paleo diet, on the other hand, supports the consumption of fruit that’s low in sugar. It’s supporters believe the fructose and glucose levels in fruit will only result in weight gain if you consume too much fruit. Plus, fruit, in moderation, has tons of nutrients can be a healthy addition to an active lifestyle. I hope this helps you to chose which diet might be best for you.